Following the rally seen in the previous session, the Dow closed up yesterday at its best closing level in a month. The positive performance on Wall Street came after the Fed announced its widely anticipated decision to leave interest rates unchanged. The Fed's accompanying statement noted a slowdown in the pace of growth, but the central bank reiterated further gradual increases in interest rates remain appropriate. On the US economic front, the Labor Department released a report showing a slight decrease in initial jobless claims in the week ended November 3rd. Trading on Friday may continue to be impacted by the reaction to the Fed's announcement along with a preliminary report on consumer sentiment in November due later today. 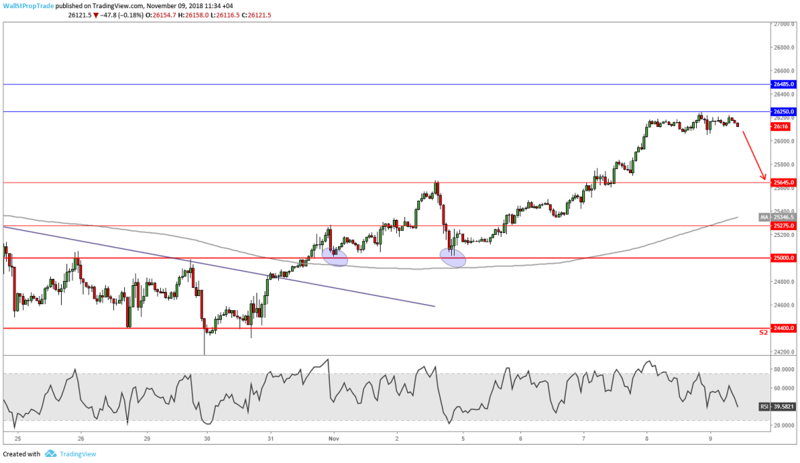 From a technical perspective, prices are trading close to the key technical resistance level at 26,250 and the RSI looks bearish signaling a downside move from here at least for the short-term. However, the trend is clearly bullish in the medium and long-term, with prices trading close to this year's high at 26952. Upside momentum might speed up should the Dow be able to break out to new highs for the year.